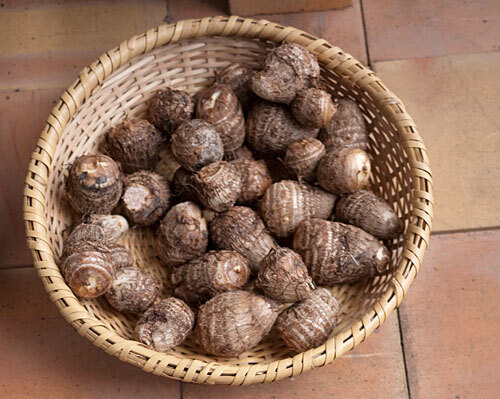 Satoimo (taro root) (explained in detail previously) is in season right now in Japan. Although satoimo is available year round these days, it's still considered a harbinger of the fall season, because of its dense, homey texture. This way of preparing them is a variation of on a very traditional country recipe, the Japanese name for which is satoimo no tomo ae, or satoimo dressed with itself. This just means that some mashed up satoimo is mixed into the sauce that coats the satoimo pieces, giving it a wonderfully creamy texture. Traditional recipes for this usually call for some mirin or sake and plain white sugar, but I've used honey instead of the sugar and left out the mirin and sake. The honey adds an extra flavor dimension to make up for the lack of mirin and sake. The most frequent complaint I get is that so many traditional Japanese recipes call for mirin, sake or both, so by leaving those alcoholic ingredients out I hope it will encourage more people to try this. Now, you do have to get hold of the taro roots themselves...potatoes or sweet potatoes won't really give the same results. 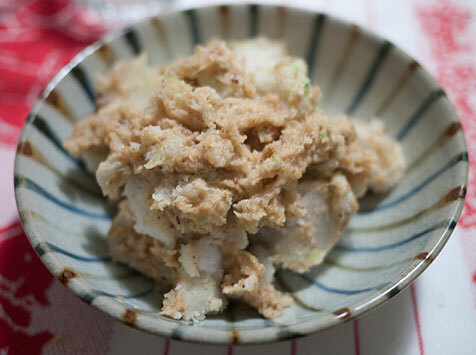 Follow the instructions on this page for preparing and cooking the satoimo or taro root in the microwave. If you don't have a microwave, you will have to boil the taro roots in water until cooked through and peel them. This is one job that is really well suited to the good old nuker. Peel the satoimo. Set aside two of them, and cut the rest into bite sized chunks. Set aside. Toast the sesame seeds in a dry (no oil added) frying pan over medium heat, until the seeds star to 'pop' and they smell nice and toasty. Take them out of the pan and onto a plate to prevent them from over-toasting. If you have a food processor, put the sesame seeds in the bowl with the chopping blade. Process until the seeds have been ground up - they will smell great. Add the two satoimo you set aside, the miso and honey, and process until smooth. Taste, and adjust the seasoning if needed by adding a bit more miso or honey. If you don't have a food processor, you will need a mortar and pestle or a suribachi. Grind up the sesame seeds to a powder, add the set aside satoimo and mash them up, then mix in the honey and miso. Mix the cut up satoimo with the sauce until the pieces are well coated. This keeps well for 2 to 3 days in the refrigerator. The sauce on its own is great too. 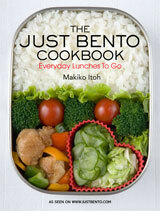 I actually prefer to use the sauce alone as a little side dish in bentos. Submitted by maki on 2010-11-08 09:10. I think those are odd complaints. Are they objecting to the alcohol, (which gets readily cooked off). I myself love that mirin and sake are in a lot of Japaneses recipes. That is what makes them Japanese. And I would guess you have more readers who want the traditional recipes (with alternative ingredients when you feel so moved) than those who don't. The alcohol in Japanese food thing is an ongoing discussion here ^_^; In this recipe, the alcohol is not really missed, especially with the use of honey. Do you have a book or ebook where I can find all your recipes? This looks interesting and I was just eyeing the taro at the store the other day, wondering what to do with it! On the alcohol - for me, I can't stand the smell or taste of alcohol. It's a psychological thing, I can't eat food cooked in wine, either. My grandma once tried to serve me pasta with a wine-based sauce without telling me and I err didn't react well (to put it mildly). So I really appreciate recipes that allow you to substitute or leave the alcohol out. This sounds very interesting. I was actually noticing the taro at the asian grocery store last weekend and was thinking I should try it one of these days. Here's my chance! What would you recommend eating this with? Would rice and veggies do? What else? Thanks for sharing those wonderful recipes. If I can find some taro roots, I just might have to try this one. It sounds intriguing! And thank you for putting the alcohol substitution in: the budget doesn't allow for me to purchase either mirin or sake right now, provided I could even find some. I just found your blog when trying to find out how to brew perfect sencha (thanks to your Mom for the instructions, by the way!). :) I started reading more, and love your site so far - I don't know how I haven't found it earlier. I love taro! My mother makes a southeast Asian version of a recipe similar to this one. Although I don't know how to make it, I know it has sugar and coconut milk. hmmm... At the moment I have exactly three satoimo in my refrigerator...would that yield enough for even one person? Otherwise, what else could I do with them?